"One of the best love stories of recent memory"
Despite the overwhelming title, this heartwarming tale of love, loyalty and passion for reading almost never made it to print. Before the novel’s release in 2008, the editor had gone back to the original author, Mary Ann Shaffer, and asked for a few re-writes. Being her first book, she desperately wanted to get the requests completed, but during the time while the pages were still in the hands of the publisher, Ms. Shaffer had become sick with cancer. Fortunately, her niece Anne Burrows was an accomplished children’s author and was able to complete the changes, thus becoming a co-author on the final manuscript. The completion of the book allowed Mary Ann Shaffer to accomplish her life-long dream of publishing a successful novel, despite dying during the same year of the book's publication and not getting to bask in her work’s popularity. The drama behind the creation of The Guernsey Literary and Potato Peel Pie Society almost rivals the wonderful story based on the island off the coast of Normandy. A small group of book lovers who had formed their literary society as a means of surviving the German occupation during the Second World War and had kept meeting after the war was over. Dawsey Adams (Michiel Huisman) had reached out to author Juliet Ashton (Lily James) about one of the books the Society had read. Upon receiving a gift of the book, he went on to share the story of the trials and joys they experienced in their little community of readers. The group’s story inspired the young author to journey to the island township and visit the small fellowship, but her presence becomes an inspiration for her writing and unearths emotions that the group would hope to keep hidden. One other tragic element about the story of Mary Ann Shaffer is that there will not be more novels written by this author. This fictionalized portrayal of actual historical events makes for one of the most compelling cinematic experiences this year. Mary Ann Shaffer's story is one of the most beautiful tales of love, self-discovery and courage to come along in years. Director Mike Newell has captured the heart of this journey and delivered one of the best love stories to traverse the silver screen in years. From the charm of the island village to the loving atmosphere of the literary society to the alluring chemistry between the lead actors, it is hard to find fault with this film. Newell manages to portray the intricate balance of the elements of the historical implications of the Nazi occupation and the impact that books had on these citizens, while maintaining the romantic tension of four individual involved in that aspect of the story. Each character of the group and the film serves a purpose and not a relationship is wasted. Credit has to go to the casting director for finding the perfect talent to represent each role on screen. It is a talent-rich atmosphere with the veteran supporting cast of Matthew Goode, Penelope Wilton and Tom Courtenay along with the standout performance by Jessica Brown Findlay. This element proves that when attention is paid to each detail of the production, the whole film lifts to a level of excellence. 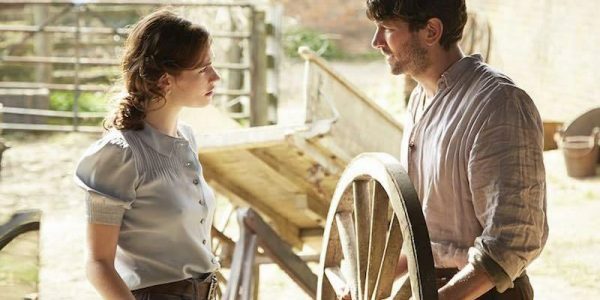 Even with the strength of the cast, it comes down to Lily James and Michiel Huisman carrying this project and they prove they can manage the dramatic and romantic elements to lift this above anything on offer over the past few years. They are able to show the intricate details and complexities of a love story that involves more than two people, but every element that surrounds their relationship. Audiences will fall in love with the story, the desire to pick up a book and inevitably cause Guernsey to have a new influx of tourism. 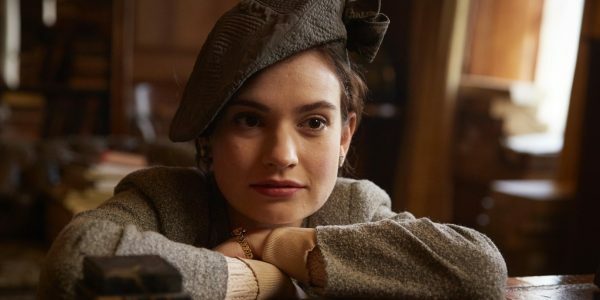 The Guernsey Literary and Potato Peel Pie Society does contain mature themes and adult situations, but the delicate and refreshing treatment of the novel makes this a film that is accessible to all ages. A cinematic gem unlike anything else this year that should be celebrated by audiences and manages to deliver a well-told story of courage and love that has not been seen for some time.